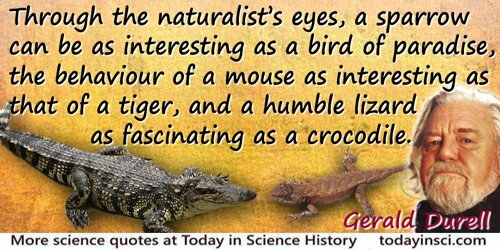 Through the naturalist’s eyes, a sparrow can be as interesting as a bird of paradise, the behaviour of a mouse as interesting as that of a tiger, and a humble lizard as fascinating as a crocodile. … Our planet is beautifully intricate, brimming over with enigmas to be solved and riddles to be unravelled. In The Amateur Naturalist (1989), 7.